Jesus is back in Galilee. His journey beyond the margins of Israel near Tyre and Sidon and the region of the Decapolis is over and they are headed back to Capernaum and then on to Jerusalem. Jesus is still teaching them that he will be rejected in Jerusalem. The leadership of the city will rise up against this threat to civil order and his heretical notion that the reign of God is at hand and that God desires mercy and not sacrifice, that God is looking for faithfulness rather than ritual purity. So he is teaching his followers, trying to open their eyes. But still his followers don’t understand. They are looking for victory in Jerusalem. For them, the reign of God is full of images of Rome cast out and Jesus on a throne. So as they head to the city and that glorious day, the scramble for power and influence begins. Who among them is greatest? Who will serve at his side? Who will share the reins of power? But Jesus is trying to teach them. So, again, he gathers a child into their midst, a child who lacks all status and significance. Surrounding him in his embrace he says simply “As you treat this child you treat me.” The kingdom of God is upside down. It is not honor and privilege that matter but compassion and service. The word of Jesus about taking up the cross lingers. The summons is to embrace the reign of God fully, to let the new world and it alone be our hope and path. “I was like a gentle lamb led to the slaughter.” – The prophet Jeremiah discovers a plot against his life by members of his own priestly clan who want to silence his message. “Save me, O God, by your name, and vindicate me by your might.” – The poet prays for deliverance from murderous enemies. “Where there is envy and selfish ambition, there will also be disorder and wickedness of every kind.” – The author speaks to the Christian community about the chaos that comes from their passions and desires, urging them to “resist the devil” and submit themselves to God. “On the way they had argued with one another who was the greatest.” – Jesus is again teaching his disciples about his coming death and resurrection in Jerusalem, but they are arguing who will get the seats of power when they get to Jerusalem. Murder is in the air in the readings for Sunday. The people from Jeremiah’s hometown – a priestly community – are out to kill him for his message. The writer of Sunday’s psalm is also battling murderous enemies, calling out to God for deliverance. Jesus is talking about his pending death in Jerusalem. And even our reading from James speaks of the conflicts that derive from our warring passions. It’s not what we hope for from religion. We hope for peace. We hope for comfort. We dope for strength and courage for the coming week. But we are reading about tough realities – and the passions that drive them. Jeremiah’s message that God is ready to judge the nation, even to destroying the temple, sounds to his countrymen like heresy and treason. In righteous rage they are prepared to defend God and country with religiously cloaked violence. God has revealed their plot to his prophet, but the prophet does not respond in kind; he puts his trust in God’s judgment. The poet also entrusts his cause to God: “He will repay my enemies for their evil.” Nor does Jesus call his followers to arms; he is teaching the way of the cross. And when his followers argue about greatness, he puts a child in their midst. We are servants not masters. Our relationship to Jesus is revealed by the way we treat the least in our midst. 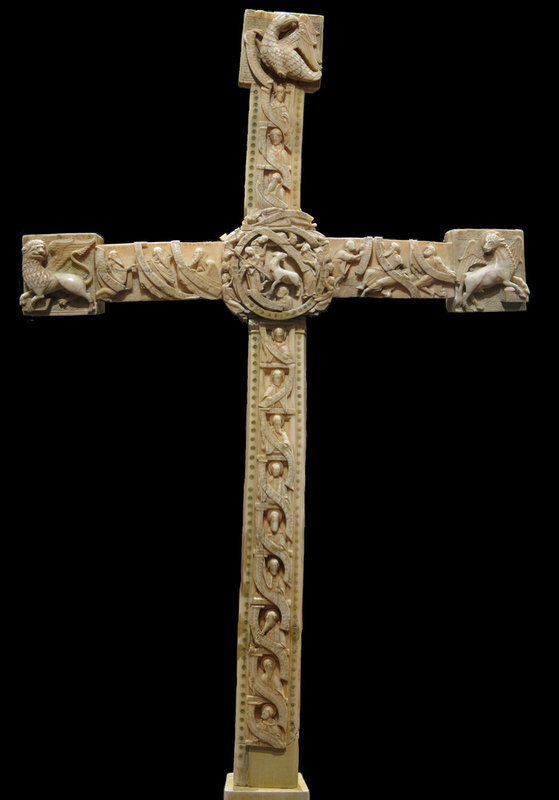 Image: Cloisters Cross, from Art in the Christian Tradition, a project of the Vanderbilt Divinity Library, Nashville, TN. http://diglib.library.vanderbilt.edu/act-imagelink.pl?RC=55094 [retrieved September 14, 2015]. Original source: http://www.flickr.com/photos/peterjr1961/4124100780/.